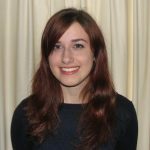 Aimee Battcock, Anna Siminoski, and alumnus Kyle Gauder will be presenting posters at the 12th Annual NeuroMusic Conference hosted by The McMaster Institute for Music and the Mind. Our colleagues at the SMART Lab will also debut a new collaborative project. Anna’s poster explores how ancillary gestures affect ensemble cohesion and the portrayal of expressivity in musicians. Her stimuli consist of excerpts from Brahms’ Clarinet Sonata No. 1 in F minor. Aimee will be presenting her poster on how pitch, modality, and timing cues contribute to the perception of emotional expressivity in music. 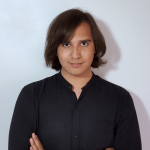 Kyle will debut a new knowledge mobilization tool designed during his NSERC USRA award. This tool visualizes the rhythmic evolution of Steve Reich’s classic piece Drumming as performed by renowned NEXUS percussionists Russell Hartenberger and Bob Becker. Additionally, Fran Copelli, Paolo Ammirante, and Frank A. Russo (Ryerson) will also discuss a new collaboration exploring the neural effects of practice in expert percussionists. This will be the first presentation of a project begin during Dr. Schutz’s work as a Visiting Professor at Ryerson while on sabbatical during 2015-16. The conference will be held on November 19th from 9:00 am – 10:00 pm at the McMaster Innovation Park in Hamilton, Ontario. This year’s theme is “The Therapeutic Nature of Music Across the Lifespan” and several prominent Music Cognition researchers will be giving talks to related to this topic throughout the day. To find out more information about this conference, click here. 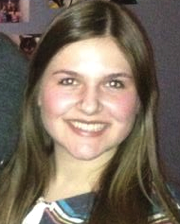 Anna Siminoski presented at the University of Toronto’s Clarinet Day on October 23. She showcased her new research project that examines movements implemented by clarinetists and pianists when performing Brahms’ Clarinet Sonata No. 1 in F minor. She studied gestures that do not directly effect sound production (e.g. head bobbing and body swaying) to see how they are used for co-performer communication and emotional expression to the audience. She also discussed the importance of music cognition for performing musicians. Clarinet Day featured solo master classes with Anthony McGill, Principal Clarinet of the New York Philharmonic, in addition to clinics by UofT faculty and a “clarinet marketplace”. It is no secret that music has the power to make us feel a vast array of emotions. Researchers have shown that by altering pitch height, timing and, modality (major/minor) they can change the emotional message of a melody. But do these changes capture the full richness of musical emotions as they occur naturally in concert halls and coffee shops? Dr. Schutz overviewed recent developments in the MAPLE Lab’s work on musical emotions in a talk titled “Music’s emotion power: Exploring the use of cues for emotion through the music of JS Bach.” The talk took place at the University of British Columbia School of Music Graduate Colloquium series (room 400B in the School of Music) at 3:30 on Friday, Sept 23rd. See our music and emotion page for more information about this project. Dr. Schutz also gave an additional talk titled “Movement and Timing: Exploring the relationship between musical training, rhythm perception, and sensorimotor integration” in a rhythm perception seminar hosted by Dr. Ève Poudrier. When listening to music we often tap our feet or bob our head to the beat. Performers also tend to make gestures more excessive than necessary for sound production. In his talk he discussed if these actions provide any benefits to listeners and performers. This talk took place at 2pm on Tue Sept 20th at the School of Music (room 400B). For more information about this project see our sensorimotor integration page. 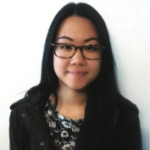 Welcome to our new lab members: Noah Little, Erica Huynh, and Arielle Spilak! 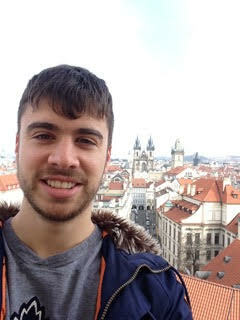 Noah Little is beginning his Ph.D. program, with interests in exploring the benefits of attending musical events, and music with movement synchronicity. He recently completed his Master’s in Music, Mind, and Technology at Jyväskylä University, in Finland. Erica Huynh is a 4th year Honours B.Sc. 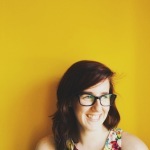 Psychology, Neuroscience & Behaviour student specializing in Music Cognition. 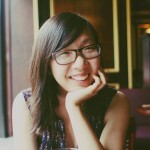 She is working on the performance gestures project for her thesis. 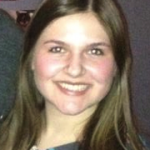 Arielle Spilak is in the Music Cognition Specialization, earning a B.Sc. through a Combined Honours in Arts & Science and Psychology. She is working on the Emotion Piano project for her thesis. We are also excited to welcome a new class of undergraduate research assistants. For more information on all lab personnel visit our people page. Several MAPLE Lab members flew to San Francisco for the 14th International Conference for Music Perception & Cognition. Notably, these lab members presented a talk or a poster (or both) on topics ranging from rhythm perception and movement to music performance choices to emotion in music. The conference was held from July 5-9 and featured numerous talks and poster presentations on all things music cognition related: Click here for more information about the conference. Fiona Manning had a talk at Music Performance 1 (Tuesday, 2:00 pm). Dr. Michael Schutz had a talk at Rhythm, Meter & Timing 2 (Wednesday, 3:45pm). 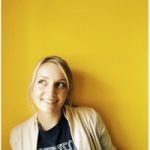 Aimee Battcock had a talk at Music & Emotions 1 (Tuesday, 11:00am). We have documented several surprising findings related to the role of amplitude envelope in auditory processing in recent years. From sensory integration to audio-visual association and even duration processing, the simplistic amplitude invariant sounds dominant in auditory research fail to generalize to sounds synthesized with the types of rapid changes common in natural sounds. 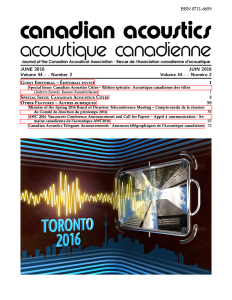 In this special issue of Canadian Acoustics, Dr. Schutz overviews a series of the lab’s recent findings on the crucial role of amplitude envelope in auditory processing. He also discusses the important implications of this work for a variety of applied situations, including the design of auditory alarms in medical devices which have not yet realized their potential for improving patient monitoring in hospital settings. 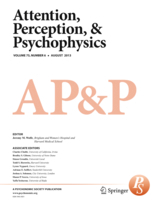 How does the perceptual system identify which sights and sounds should be integrated? Although traditional explanations focus primarily on coincidence in space and time, evidence is now emerging for the role of context/congruency. Yet previous research suggests this role is confined to speech (Vatakis & Spence, 2008). Lorraine Chuen provided novel evidence that this process is also invoked when hearing musical sounds using videos pairing cello and marimba notes with either matched (i.e., cello/cello) or mismatched (i.e., cello/marimba) gestures. By documenting the importance of amplitude envelope in evoking the “unity assumption” in non-speech sounds, she provided an intriguing expansion of the lab’s contributions to our understanding of this important acoustic property. This is now available from our publications page. 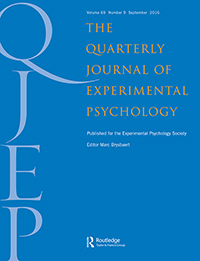 Dr. Schutz now has an article in press in Quarterly Journal of Experimental Psychology (QJEP) in collaboration with Dr. Jeanine Stefanucci (University of Utah), Sarah Baum and Amber Roth (College of William & Mary). This study explores the role of amplitude envelope in learning and memory, identifying considerations important in designing auditory and associative memory psychological research. The study focused on comparing the differences between “flat”, “percussive”, and “reverse percussive” tones (see our demo for an example). Through a number of different experiments, participants were asked to learn associations between physical objects and one of the three types of tones. They hypothesized that participants hearing percussive tones would have better recall performance when remembering those object-sound associations than when hearing reverse-percussive or flat tones. Throughout four experiments, participants hearing percussive tones repeatedly outperformed participants hearing flat or reverse percussive tones. The lab’s interdisciplinary projects hold practical implications for diverse audiences. Whether you are a Bach buff, percussion pundit, or cognition connoisseur, the work being done by our students can help inform your work. 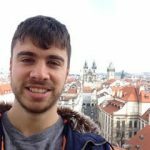 Kyle Gauder received a 2016 NSERC-USRA (University Student Research Award) for a project aimed at creating online tools for knowledge translation. 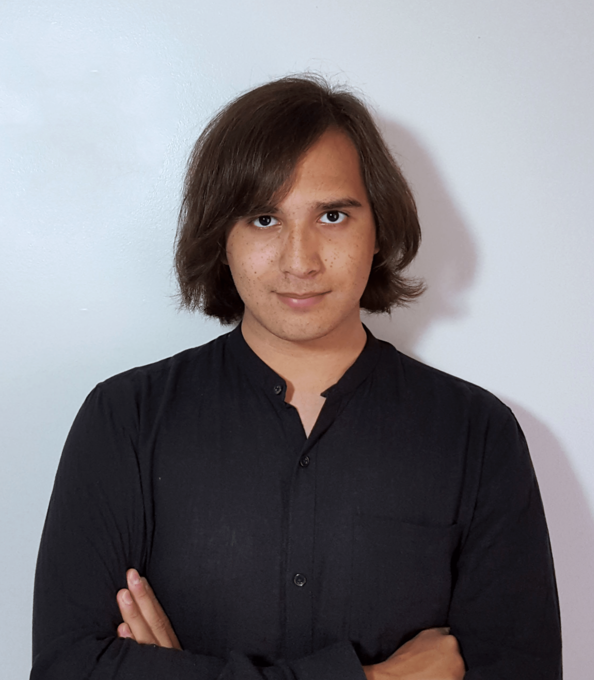 As the lab’s previous technical assistant, he will draw upon his background in both psychology and computing to develop new tools for communicating important lab findings. One project offers a dynamic, interactive visualization tool offering insight into JS Bach’s landmark composition Well Tempered Clavier (Book 1), debuted at the International Conference on Music Perception and Cognition in San Francisco. Bach’s composition containing 24 Preludes and 24 Fugues in all major and minor keys inspired similarly structured works by Frédéric Chopin (Op 28), Alexander Scriabin (Op 11), Dmitri Shostakovich (Op. 87), Dmitry Kabalevsky (Op 38). Kyle’s tool will help students, researchers, and enthusiasts of J.S. Bach explore different interpretations of these historically significant pieces – cataloged as BWV 846-869. Others tools will visualize key data sets from particular projects to aid in communicating findings from our studies to the university community and beyond. 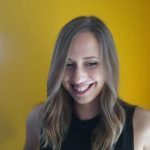 The popular Toronto based magazine Now featured a profile lab alumni Monique Tardif. 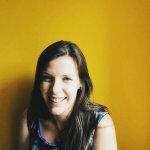 The article featured stories on recent university graduates working in their chosen field, and discussed Monique’s experience finding a music cognition position shortly after graduation. 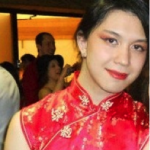 During her time at McMaster, Monique competed a thesis related to rhythm perception in 2015, previously held an NSERC-USRA, and played for several years in the University Percussion Ensemble. 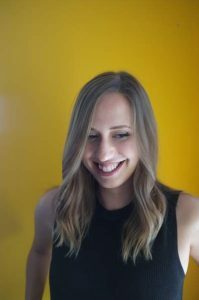 The article discusses her experiences as a student in McMaster’s innovative new music cognition specialization, her research as part of our team, and her new professional role as lab manager at Ryerson University’s SMART Lab. This feature not only provides insight into careers in the arts, but gives perspective on one alumni’s experience combining her interests in the arts and sciences. Click here to read the article. The latest offering in Cambridge University Press’s acclaimed series on musical topics, the Cambridge Companion to Percussion discusses the evolution of percussion from historical, scientific, academic, and applied perspectives. 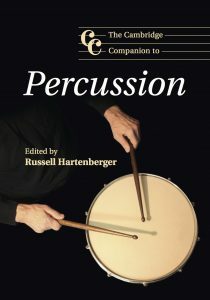 Edited by noted percussionist Dr. Russell Hartenberger, this book includes contributions from many of today’s leading performers and composers including William L. Cahn, William Moersch, Garry Kvistad, Rick Mattingly, Colin Currie, Aiyun Huang, Russell Hartenberger, Steven Schick, Bob Becker, Steve Reich, Peter Erskine, B. Michael Williams, Adam Sliwinski, and Michael Bakan (a complete list appears at the link below). Dr. Schutz’s chapter Lessons from the laboratory: The musical translation of scientific research on movement summarizes numerous studies on movement and music, emphasizing their practical implications for percussion performance and pedagogy. The chapter offers a plain language discussion of how to best use scientific research on movements to improve performance and pedagogy. The book is scheduled for release in North America in May 2016. Click here for more information. The University of California MERCI (Music Experience Research Community Initiative) program sponsored a special lecture/recital at UC Davis. 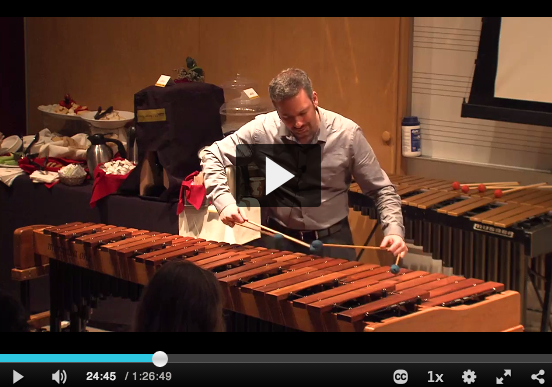 Dr. Schutz performed a variety of solo literature for percussion illustrating the musical basis for our team’s research including pieces for marimba, vibraphone, and snare drum. These solos illustrate the musical principles guiding the lab’s ongoing work on multi-sensory integration in musical performance and perception. 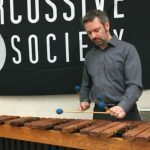 It also served as an opportunity for the audience to learn about solo percussion literature, and discuss future research opportunities at the intersection of music performance and cognitive science. This talk was being co-hosed Dr. Petr Janata (UC Davis) and Dr. Ramesh Balasubramaniam (UC Merced). An archived video of the performance is now available courtesy of MERCI, and can be found at http://merci.ucsd.edu/events/2016-03-11/ or by clicking the image below. Dr. Schutz discussed the lab’s latest research on amplitude envelope for a lecture series at Stanford University. Given CCRMA’s important role in laying the foundation for research on acoustics, perception, and music cognition, this opportunity to discuss ongoing lab projects with researchers will be insightful. He also visited Dr. Takako Fujioka’s new lab to learn about her team’s ongoing projects. Learn more about the talk and/or watch an archival recording below to see an overview of the lab’s recent discoveries. 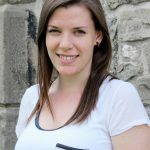 Five lab members presented posters at the LOVE Conference in Niagara Falls: Fiona Manning, Annilee Baron, Kimberly Germann, Anna Siminoski, and Aimee Battcock discussed new findings on a variety of topics, ranging from movement and emotion to timing to sound shapes. Click here for more information about the LOVE Conference. We move to the beat all the time by tapping our fingers, clapping our hands, and even dancing. Fiona Manning is currently researching whether this movement improves our timing abilities. The PNB Department invited her to share her vast knowledge as part of the the PNB Colloquium series—talks typically reserved for faculty members. Click here for more information about her talk. Dr. Schutz gave a talk for the Ebbinghaus Empire Series at the University of Toronto titled “Dynamic sounds and perceptual processes: The surprising role of amplitude envelope in auditory perception.” In his talk, he reviewed the MAPLE Lab’s growing body of work on amplitude envelope (the shape of a sound over time) and its often overlooked importance in the process of audio-visual integration. An archived video of the presentation can be viewed below. For more information on these topics, please visit our pages on amplitude envelope and audio-visual integration.